THE DRAFT REPORT of the banking inquiry has been finalised but two members of the committee have decided not to sign off on it. 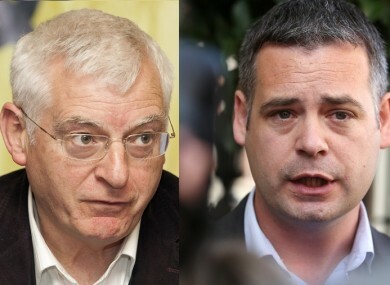 Sinn Féin finance spokesperson Pearse Doherty and Anti-Austerity Alliance TD Joe Higgins have said they will not back it. Members of the inquiry committee signed off on the report after a 15-hour session yesterday, but they failed to agree on an executive summary due to time constraints. The report instead contains a chairman’s summary which sets out some of the key findings and background to the crisis. Committee chairman Ciarán Lynch said yesterday evening that the 11-chapter draft of the report has now been completed and will be sent for legal review. On RTÉ’s Morning Ireland today, Lynch said the draft report will have to be examined by implicated parties once it returns from the inquiry’s senior counsel this week. The report will be published and brought before the Oireachtas in the last week of January, following a review of the consultation process, he added. Yesterday morning, Doherty was the first to confirm he would not back the draft report. He said that when he agreed to take part in the inquiry, he was first thinking of the people who had lost their homes and businesses, the cuts inflicted on public services and those who had been forced to emigrate. “The people have the right to know how the banking crisis came about, who was responsible and to be assured that it would never happen again. I have worked constructively on the inquiry to get to the full truth of what happened,” he said. While the report includes new information, it fails to fully answer the questions regarding how the crisis came about and who was responsible. Yesterday evening, Higgins released a short statement to confirm he has formally told the committee of the banking inquiry that he is not in a position to sign the report. The TD, who has previously voiced concerns about the report, wrote a letter to Lynch outlining the reasons for his decision. The AAA TD argued that to understand the factors which impacted on and contributed to the crisis, they had to be put into the context of the “dominant economic system of finance capitalism and the workings of the financial markets and how that system operated internationally and in Ireland in the decades prior to, and during, the financial crash”. He said the majority of members of the committee are committed to the current system and will dissect “the causes of the property bubble, the subsequent crisis and economic crash with the ideological tools that inform their judgement and will propose their findings and recommendations accordingly”. “They will arrive at an analysis and conclusions that are fundamentally different to mine,” he added, noting that they are part of a government which still accommodates the system. “I do believe, however, that there is both documentary and oral evidence that was given to the inquiry itself which validate my general analysis and conclusions. In this respect I made some submissions at an earlier stage in the process which weren’t reflected in the broad thrust of the draft report. However I am in a minority position and as far as the Report is concerned the majority will decide the tenor of the report. A report of hundreds of pages, which, in my view, is informed by the ideological underpinning of the majority view, is not amendable from the perspective which I have brought to the evidence and to the public hearings. He confirmed that he will disseminate his own analysis and conclusions after the publication of the official report in January 2016. Higgins also believes that there should never be another inquiry under the Houses of the Oireachtas (Inquiries, Privileges and Procedures) Act 2013 because its demands are “absurd”. First published 6 December. Additional reporting by Rónán Duffy, Sinéad O’Carroll and Catherine Healy. Email “The draft banking inquiry report is finally ready - but with no executive summary”. Feedback on “The draft banking inquiry report is finally ready - but with no executive summary”.